The Cumbrian town of Kendal is well served by local and long distance services. During 2015 Stagecoach local services switched from the centre of the town to the bus station to improve reliability, joining the long distance services. continuing to Windermere, Ambleside and Grasmere and thence to Keswick. A Volvo B10M from the Stagecoach fleet passes through Kendal in July 2015 on the Arnside service.These step-entrance vehicles were once the mainstay of the Stagecoach fleet but from 1st January 2016 they won't be allowed in service as they don't comply with DDA regulations. Stagecoach Optare Solo is ready to depart on route 41 to Oxenholme where the bus will visit the West Coast mainline station, proving a frequent link to services south to London and north to Scotland. This particular example carries the attractive Lakeland green livery. 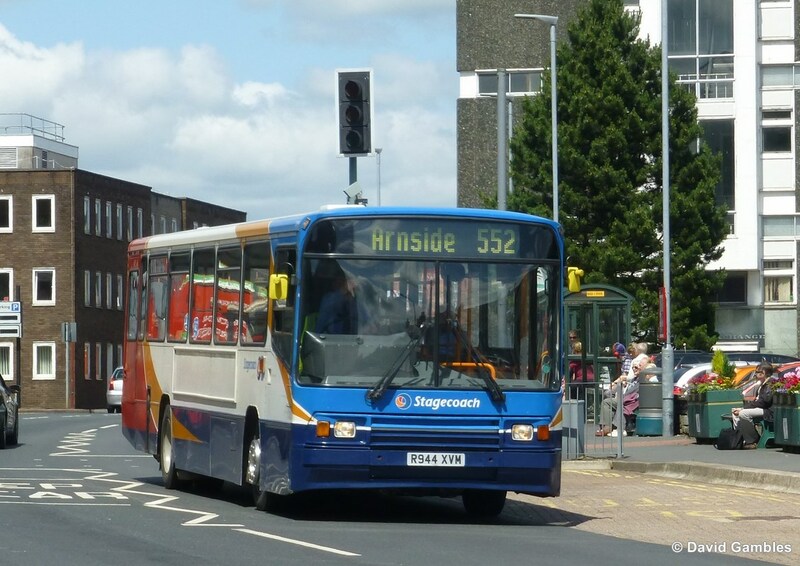 Stagecoach no longer run through the town centre in an effort to improve time keeping. These pictures were all taken before the buses were diverted. As a contrast, an Optare Solo on the same route but in standard Stagecoach livery. Just when you assume that the vehicles passing through Kendal town centre are somewhat predictable, a surprise visitor operating on the town service is Stagecoach 18382 a Dennis Trident 2 with Alexander ALX 400 Body. This bus is one of the fleet that normally operates in the lake District and carries the attractive green version of the Stagecoach livery. It is being pressed into service on one of the local town services and again no longer is seen operating in the town centre now that services are diverted via the bus station..
Cumbria County Council have withdrawn most of their support for local bus services, resulting in the wiping out of most routes. 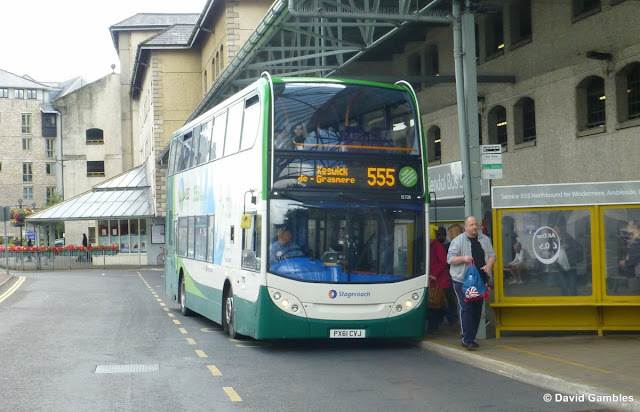 One surviving service is the 563 which runs between Kirkby Stephen and Penrith. Here we see former Trent Optare Excel Y249 DRC waiting in Kirkby Stephen before departure to Penrith. When we visit Cumbria we always see vehicles from the fleet of Cumbria Classic Coaches and we are pleased to report that that their recently registered bus services are doing well in combination with their well established ones. CRN 80 pauses at Tebay Services on a test run to Kendal before the service was registered. This weekly service between Brough, Kirkby and Stephen to Kendal is now well established and normally requires a double deck vehicle to cope with the number of passengers. The company also carry out a large amount of private hire work which includes weddings and other special occasions and whilst strolling through the sleepy village of Ravenstonedale we came across a Cumbria Classic Coaches Leyland PS1 carrying a party of very happy ladies who were enjoying a hen party. As I was introduced by Alison the driver as the official Cumbria Classic Coaches photographer I could hardly ignore the opportunity to get some of the ladies to pose for the camera and below is a small selection. Whilst showing a Cumbria Classic Coaches vehicle might we take the opportunity to mention the 2016 Kirkby Stephen & Brough Easter Rally which will take place this year on Saturday 26th and Sunday 27th March. Most of the Cumbria Classic Coaches fleet will be in service during the weekend plus many visiting vehicles. Tel 015396 23254 for further details.